Dark Nights: Metal #6 review: An ending worthy of the hype – AiPT! ‘Metal’ has been worth the journey. I do my best in this humble forum to be honest about the comics I get to read. It’s only fair to readers and creators alike for those who stand up criticism – constructive or otherwise – to be honest. I have read every issue and tangentially-related issue of DC’s Metal event and have been on a rollercoaster of emotions about the content in the book, how long it took to get out, how certain BIG ideas were executed, and how each issue added to the greater narrative. So, in prefacing with that statement, I want to say that Dark Nights: Metal #6 is the conclusion I hoped for from the start, nine months ago. When we last left our heroes, pretty much everybody was completely boned and there was no hope for anyone except maybe, maybe a monkey and his friends from Universe #53. Every plan had been thwarted easily, every move calculated coldly. Superman and Batman, aged and broken, sunk deep into the fires of the World Forge under the hammer of the monster that had once been Carter Hall, the Hawkman. Wonder Woman raging as she battled impossible, multi-dimensional odds. Hope shattered under the direction of The Batman Who Laughs. Now, with the end finally upon us, hope finally glimmers again. Wonder Woman and Kendra Saunders – the now Lady Blackhawk – find a way into the World Forge to confront Hawkman and somehow rescue Clark and Bruce. Plastic Man, the most physically unstable, but potentially most powerful, person in the DC multiverse, emerges from his egg ready to lay down a beating. This is really the point where everything turned around for me personally as well. It would be one thing to have a sudden Deus Ex Machina show up to save the day. There are several “at the right moment” events in this issue, including the arrival of the Ultima Thule bringing with it Batmen from as many light universes as they could muster to battle those in the dark. The biggest turning point for me came at a moment of what could have been the greatest personal sacrifice of the entire series: Wonder Woman diving into the World Forge in an attempt to rescue Batman and Superman. She was the one who was able to call together the Justice League to battle, she found a way to reach Hawkgirl despite the influence of the dark metals within her, she is the one who – simply by who she is – makes people see their own truth. If there is anyone who can unite the universe against a foe and gather heroes to save the day, by the gods, it is Diana of Themyscira. This is not to say that making Wonder Woman the hero of the day is the thing that fixes all of Dark Nights: Metal’s issues. It certainly does its part, but it doesn’t erase the unevenness of the series in the middle and the wild chaos that was, at times, its storytelling. In trying to fully grasp everything happening in the story, I had to look up so many references, had to page back and forth to try and put the story together in a way that didn’t seem random with sudden bouts of insanity. Snyder has put together a comprehensive story but it feels about two issues short of a complete one. With more time, perhaps a more casual reader could grasp the references without needing an entire back catalogue and their favorite search engine. The other thing that really hampered this series is the release timing. With it being such an overwhelming change to the DC Multiverse (more on that in a moment) why were there such gaps in the release schedule? Why was this such a self-contained series, not seemingly affecting many other books in the DC catalog? In the end, I really believe that this series will be much more satisfying when read as a solid trade rather than episodically. That’s not a bad thing, unless you’re releasing the book episodically over 6-9 months. While I truly and freely admit to knowing nothing about the process that gets a comic to my FLCS, I’m disappointed that there wasn’t the drive to make this feel like a constant, rolling story. Rather, the gaps between issues (that grew as the story went on) really hurt its ultimate impact. Going back to the journal of Carter Hall to lead into the final chapters of this story leads us back around to the beginning, the place where all good stories should go. Time and tales are cyclical. Those who we know to be heroes finally come back to the light. The introduction of 10th Metal is well done despite being sudden and used to put a decently final end to many of our sadly neglected evil Batmen. We finally see The Batman Who Laughs’ backup plan, attempting to just finally destroy everything by combining the Over-Monitor with the brain of the Anti-Monitor. Seems extreme, but, hey, who’s counting at this point? BWL does revel a bit in his ability to know everything Bruce is going to do, but being so without a personal code that he is willing to use the gun that killed his parents to take out his now greatest enemy, all while monologuing like a true villain. That is the perfect moment to meet our Batman’s backup plan. Read the book – it’s worth it just for the reveal page. Artist Greg Capullo nailed that one. So, in the end, how is this a change for the whole DC Multiverse? Well, first, there is no true Deus Ex Machina. There is, however, a Homo Ex Machina, to coin a phrase. There is metal from the World Forge, this 10th Metal, in all of creation, and the Justice League bands together to call all humanity together, forming something greater than the sum of its parts, to lift the Earth out of the darkness, while in the process breaking out of the limited multiverses into the greater extent of creation. There are new threats on the horizon, new discoveries to be made. Thanks to the Justice League, a new age of heroes is dawning. Maybe they should construct some sort of building where they could meet. Cosplay alert: While the men of the Justice League all wear tuxes (boring), the women wear some of the most cosplay-able gowns I’ve seen in comics in a long time. Trust me, you’re going to see Wonder Woman and Hawkgirl gowns for years to come. 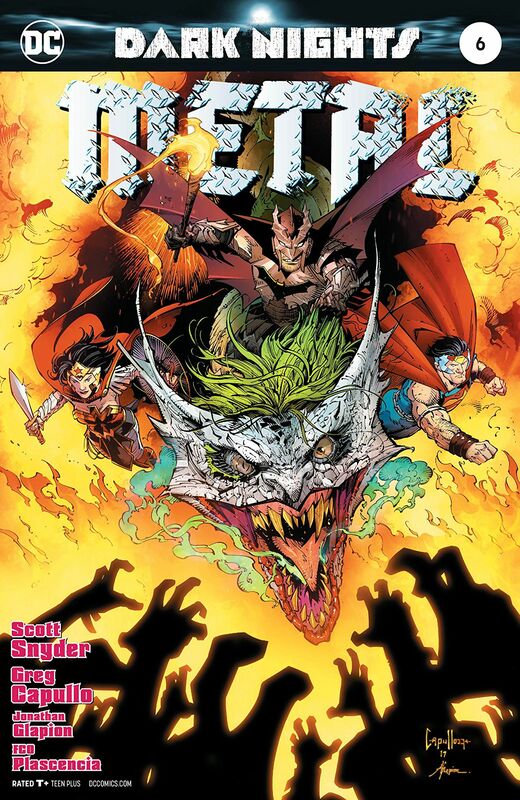 Finally, what is the verdict on the Dark Nights: Metal series? In my opinion, this was ambitious, maybe even beyond that. There are so many ideas being thrown around, building in a dozen directions at once, that it is difficult to get a full grasp on everything happening in the first read, especially as an episodic series. I think this series, depending how long its ripples into the greater DC continuum last, will grow into itself, given time. When the final trade of this series is released I believe you will find a new audience that jumps in feet first. Like all things, it is by no means perfect, but for the work it has done and the new change to an entire comics universe it has wrought, it has been worth the journey. It is rebellious and shocking and will be remembered for introducing some of the most vicious villains ever seen in comics. And, in the end, that’s pretty metal. Like all things, it is by no means perfect, but for the work it has done and the new change to an entire comics universe it has wrought, it has been worth the journey. It is rebellious and shocking and will be remembered for introducing some of the most vicious villains ever seen in comics. And, in the end, that's pretty metal.